We're thrilled to be a part of the Craft & Hobby Association's Mega Show in Anaheim, California this weekend! Our team has been busy behind the scenes working to bring you exciting new craft products, and we're sharing with you an exclusive sneak peek at what's to come in 2015. Express your sense of style with our new super soft fabric ink, Fabric Creations™! The formula is perfect for stamping, stenciling and brushing on fabric. Available in 35 colors, including neons, metallics and glitters, it's ideal for both fashion and home decor projects. Also making their debut are our Block Printing Stamps. The art of block-printing goes back over a thousand years, practiced by traditional artisans across India. Use them to create one-of-a-kind designs on textiles, fashions, scrapbooking, paper and more. Next, we all know Cathie & Steve are the embellishment experts, and this year they bring you a unique tool to make creating Mod Podge Mod Melts even easier! The Mod Podge®‎ Mod Melter is a unique shaped tool you can use to fill Mod Molds with Mod Melts. You're also able to use it as an all-purpose, high temp glue gun. The easy control trigger, silicone soft grip and built in stand make it a breeze to use! We also introduce our popular Apple Barrel®‎ Acrylic Paint in a Multi-Surface formula. Get the same results as the original but with the added value of multi-surface coverage. Next up? The Mod Podge®‎ family grows to include three exciting new formulas. We welcome a trend-right Ultra Matte Chalk finish, a Clear Chalkboard Topcoat and Pearl, for a touch of sheen. 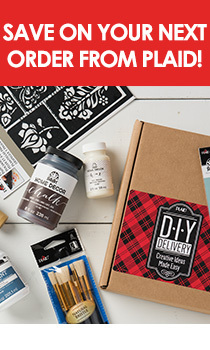 We know many of you are waiting on this fun news... FolkArt®‎ Home Decor makes it even more fun to restore your decor this year with the addition of 26 new colors, finishes, sealers, stencils, brushes and tools! Martha Stewart Crafts®‎ welcomes new colors, waxes and brushes to the Vintage Decor line! ... And the FolkArt brand adds exciting stencils, including our Alphabet & Monogram Paper Stencils. Get a personalized look with the multi-font, multi-size pack of paper stencils. Also new are soft grip brushes to give comfort and control to painting. Our Bucilla line brings many exciting products this year! Cathie & Steve's wear-a-stitch lets you stitch wearable jewelry! Also new are our fun stamped embroidery kits come in fun designs, including a denim kit from Handmade Charlotte, and Stichables in new fun sizes! We wish we could share it all with you, but we're out of time and headed back to the CHA show floor! Find out about other new designs and additions to our product lines on our website. Stay tuned for product release dates and retailers.